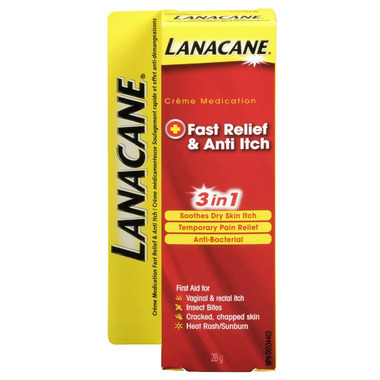 Lanacane Creme is specially formulated with an itch-stopping anaestheic which starts to work fast to relieve itching and quiet the urge to scratch. Lanacane is greaseless, vanishing and easy to use. Prompt temporary relief for dry skin itching, vaginal and rectal itching, cracked, chapped skin, insect bites, chafing, rashes, sunburn, minor burns. Medicinal Ingredients: Benzocaine 6%, Resorcinol 2% W/W. Non-medicinal Ingredients: Water, Stearic Acid, Glycerin, Glyceryl Stearate SE, Sulfated Castor Oil, Sodium Borate, Triethanolamine, Ethoxydiglycol, Isopropyl Alcohol, Parfum (Fragrance), Chlorothymol, Zinc Oxide, Diethylhhexyl Sodium Sulfosuccinate. Dear Well.ca, could you please stock the product: Lanacane Anti Chafing Gel? It can be used to soothe skin irritations as well as a makeup primer! Thanks! I give this a 4 only because they have a product called Mayan Magic balm thats works a lot better for pain and irritation that works better for bug bytes. Great product, very good price! product does what it claims to do.